On June 15 a new musical has arrived on the big screen starring Tom Cruise, which is strange because you have never imagined that Tom Cruise is doing a musical. The movie is all about the rock scene in the 80s, not only the music but also the cloth and other things that is related to the 80s. The music is all from Def Lepard, Bon Jovi, Gun N’ Roses, Twisted Sister, Foreigner, Journey, Poison, Whitesnake, and other singers. The movie is based on a big Broadway musical play that has been successful for years now. The movie stars Diego Boneto, Julianne Hough (Ryan Secret’s girlfriend), comedian Russel Brand from Forgetting Sarah Marshall, Alec Baldwin from 30 Rock, Oscar Winner Catherine Zeta Jones, and Tom Cruise. This cast can make any movie a success and we all now that they have some music experience. The movie is set in Los Angeles in 1987 when rock was as big it will ever be. The movie centers around the Bourbon room that has hit by some financial problems so it needs a performance by Stacey Jaxx who is like a god in the rock music stage. The problem is that Stacey is not the same like he has been a very long time so you don’t know if he can do a performance like he used to do a long time. Also he has to do an interview with Rolling Stones about his new career path and how he wants to change and of course how big he is in the wold of Rock and Roll. Another part of the movie you Drew who wants to be Stacey Jaxx and he is a Rock star that wants to hit it big and the only way he can do that is if he makes a good performance in the Bourbon room as well. Drew has a very good-looking girlfriend that is helping achieve his dream named Sherrie she works in the Bourbon room as a waitress but has dreams of becoming a singer so she wants to help Matt so that she as well can realize her dream. So the movie centers on dreams on whether or not any of the characters can achieve this. Also we have to see if Stacey Jaxx can save the Bourbon room or not. What I really enjoyed about the movie are the music because they are quite amazing when you think about it. The music is the center of the movie, and that part works perfectly in my opinion because I truly love these songs that I grow up hearing. What i was particularly surprised by was Tom Cruise’s performance because you would have never thought that Tom Cruise has any musical ability, but what is strange he does. His performance was very incredible, he really made me and other people believe that he is a rock star. The thing that I believe is bad about the film is that it doesn’t work because with this type of music you need either a concert or a play, because when you hear the music you either want to dance or sing to it and you can’t do that in a cinema. I am sure that the play is much better, because of this so in that sense the movie fails to capture the essence of what a real performance should be. The final reason the movie fails is because of the crowd you feel that you want to dance and sing but you are so limited because you don’t want to bother the people around you. So I would say skip this movie unless you want to hear these songs or see Tom Cruises’ performance, which was special. 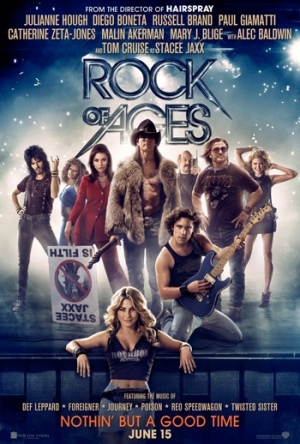 Here is a link to get facts, pictures and other things about Rock of Ages.